I feel like there will be a lot of voting posts today. So I will only commit this short paragraph to voting and then I will get on with the rest of my post. Please go and vote (and be an educated voter). And pray for the leadership of our country, regardless of who is voted in. When I'm not constantly complaining and campaigning in relation to LEO topics, I am actually a normal person. Well, maybe normal is taking it a little too far, but I'm not like a robot that just talks about police stuff. 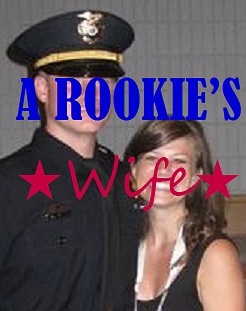 Just like Officer is a rookie, I'm a rookie wife. A very ambitious rookie wife. I'm sure most of you bloggers out there are victims of Pinterest. I don't know how many home improvement, organization and craft projects I have pinned, but it's getting out of control. I always have the next best idea for a project for our home. And it NEVER turns out like the picture. And it always creates a lot of work for Officer. Babe, I promise I can do this by myself... wait, can you hold that? Can you lift this? Can you nail that up there? Can you... will you... just a minute longer? I'm so grateful to have a patient husband. And don't the dinners they post always look delicious? When you finally click for the recipe you would need to be an iron chef to understand what you were making! How do I give something to Officer when I can't even pronounce the ingredients in it? Or better yet, how do I find that item in a grocery store? We aren't fortune enough to live in a place with grocery stores much nicer than the big W. So we don't have the luxury of all these fine ingredients. I have to stick to the recipes I know, but they just take too dang long to make once I'm home from work and working out. Being a wife is tough work (I totally think it gives police work a run for it's money). Since I have so many failures, I'm going to share with you my only success. A no sew curtain for the kitchen. (I can already hear your laughter that my only success was A NO SEW curtain). I'm also going to share with you a few pics of the pup, Scout. Just because I think she's fabulous and she's my biggest success (since I picked her out, ha). Check out this bad boy! I'm pretty proud of it - it only took about 30 minutes or so! And now the neighbors can't look through our window anymore! This is Scout as a pup. She just loved that little duck toy. Alright, maybe she only loved it for a few minutes before she shredded it. But for a few minutes, she loved that thing. Do you have any successful projects? Or massive failures? And does anyone have some simple recipe ideas for me? !